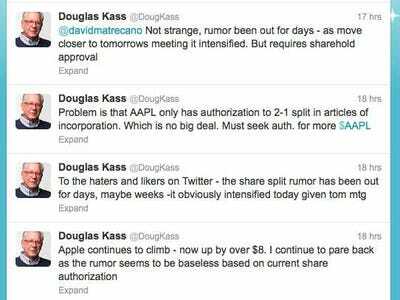 Here’s something that will make you feel a little bit queasy.Yesterday, investment manager, and media personality, Doug Kass tweeted a rumour that Apple was going to announce a stock split today. 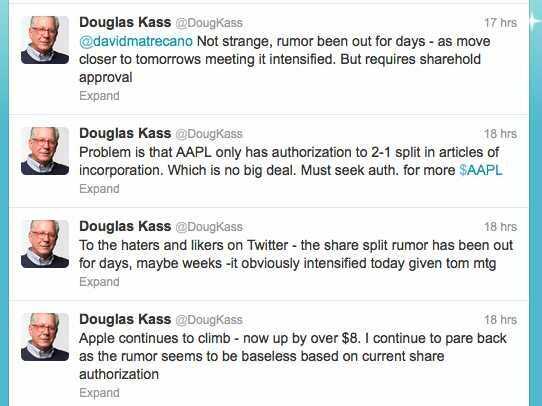 Right around the time he fired off his tweet, Apple’s stock was taking off, erasing a loss on the day. Was it because of his tweet? It’s hard to say. Stocks move in mysterious ways. We really don’t know what was driving the gain. 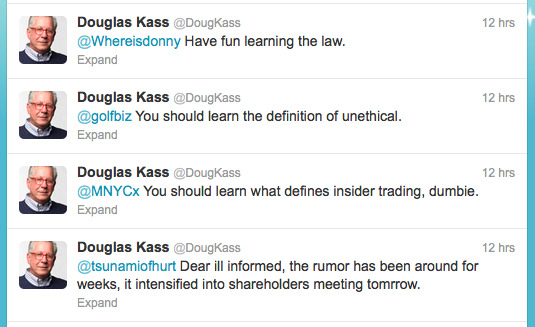 But, the simplest explanation would be that Kass’s tweet could have driven the stock. After he set the rumour in motion, and the stock took off, he followed up by saying he was selling his Apple shares, notes Philip Elmer DeWitt.He was selling his shares because, upon closer inspection, he decided the rumour made no sense. Kudos to Kass for being transparent, but boy does it look fishy. He was getting hammered on Twitter and defended himself by saying the stock split rumour has been floating around for days, and just picked up steam because we’re closer to the shareholder meeting. He also called people who said he was breaking the law “dumbie” on Twitter. So, there’s that. Whatever the case may be, it’s one of those sketchy areas that’s a good reminder not to treat everything you hear on Twitter as the gospel truth. But, you already knew that.